Another one for the “too good to be true” file — recent reports suggesting the Army football team was on track to play Notre Dame at Yankee Stadium in 2013 have been shot down by a Notre Dame spokesman, who told ESPN.com blogger Matt Fortuna that the Irish won’t play the Black Knights in 2013. Fortuna had picked up the initial report from the Times-Herald Record on Friday. The Record cited an unnamed source who claimed the deal for a 2013 game at Yankee Stadium was already done. According to an Army news release from 2011, the Black Knights are already booked up with 12 games in 2013, but that comes with two caveats. First, a scheduled game at Hawaii makes the Black Knights eligible for the so-called “Hawaii exemption,” meaning they could add a 13th game to their regular season. Second, games scheduled against Morgan State, Western Kentucky and the like could suddenly vanish from the slate if Notre Dame had a free weekend (this unofficial 2013 ND schedule only lists 11 games, so the Irish have to add somebody). 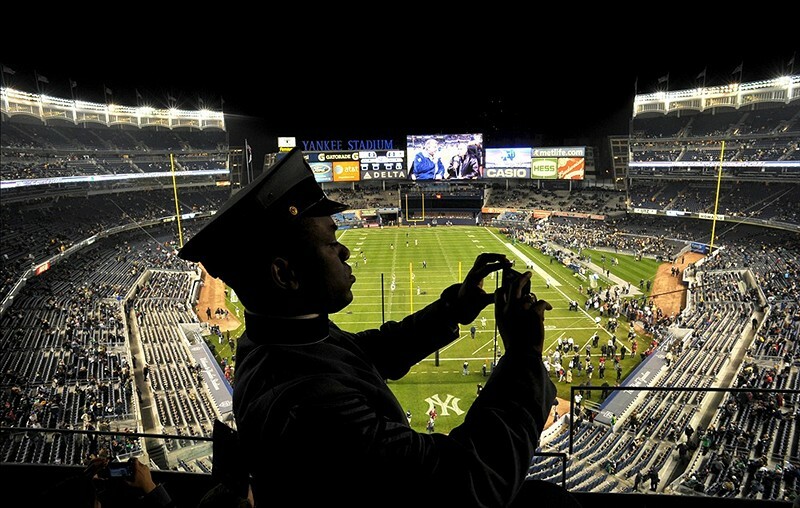 Before Army’s 27-3 loss to Notre Dame in 2010 in the Bronx, the Black Knights hadn’t played at Yankee Stadium since 1969 — a 45-0 loss to the Irish.